At the weddings, the bride is the center of attraction for everyone and therefore she should look stunning in her wedding dress and hairdo with the addition of flower braid ribbon. 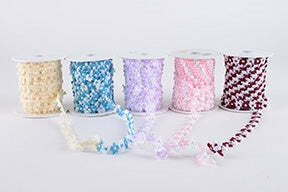 The flower braid ribbons we offer are easily available in almost all the colors. These types of ribbons give a stunning look when added to some hairstyle that is perfect for the occasions like weddings, anniversary parties and other celebrations. We are offering this stylish ribbon in a variety of shades as it will get easy for you to pick the one you are searching for. Here you can get the chosen flower braid ribbon at the most reasonable rates. This kind of decorative ribbon could even be used as the hair accessory, as a decorative element at the weddings and even for wrappings gifts in a stylish way.